A first for this blog, with some video I took during the trip. Did not manage to film everything as planned, but it will hopefully give you an impression of the landscape. It was cloudy and not a particular bright day, but I decided that it wast just the right light to make a trip to Bugøynes and Karlebotn. Bugøynes is a small fishing village. It’s know for king crabs which are being exported to many countries. My visit had nothing with king crabs to do, but the local church I wanted to photograph for a series I am doing. Situated at the sea, it has a rough climate. A walk through the village is worth it, especially for a photographer. I did only a short stop in Bugøynes, as my goal was to make an image of the little chapel in Karlebotn. There are quite a few of these small chapels and churches in Finnmark. The sometimes unusual architecture and the location make for interesting image oppportunities. As with many buildings, the chapel was build in the 50s after WW2. Due to the war you do not see many buildings from earlier periods in northern Norway. The grey sky and slight fog created amazing light to photograph. A blue sky would have changed the setting completely. The plan was to do a snowshoe hike afterwards, but the days are still short in the north and so I did not manage more than a short walk on my way home. But winter is far from over, so there will be more trips coming the following weeks. Recent days have been the coldest here this winter. This is no surprise, as the second half of January often is the coldest period in the arctic. The sun has returned, but it takes time before this has an effect on the temperature. Due to the cold (-28°C today) I decided to try something which I have seen before, but never done myself. Maybe you have heard of the effect when you throw boiling water up in the air in extreme cold. It turns instantly to snow. To do this requires no special skills besides having boiling water. The next step is to photograph this, which requires some equipment and good timing. The setup in my garden was like this: My camera on a tripod, a flash mounted on a softbox with a wireless trigger and my girl friend pressing the shutter button at the right moment. Fufjilm X-T3 ISO 400 23mm f/1.4 1/2000 sec. You can of course do this without the flash, but in this case it was simply not enough light. If there is not enough light, use a flash. It also helps separate your subject from the background. I choose the power of the flash manually, as it gives me more control over the outcome. Short shutter speed: In this case it was 1/2000 sec to freeze the action. In combination with a flash you need a flash that supports HSS - High-Speed sync. Aperture: I chose f/ 1.4 to capture more light. You don’t need such a large aperture, should you have not enough light you can try a higer ISO value. ISO: As low as possible to achieve a fast enough shutter speed. And most important: Have fun experimenting! In January the sun comes back to arctic Norway, but it’s also the coldest time of the year. 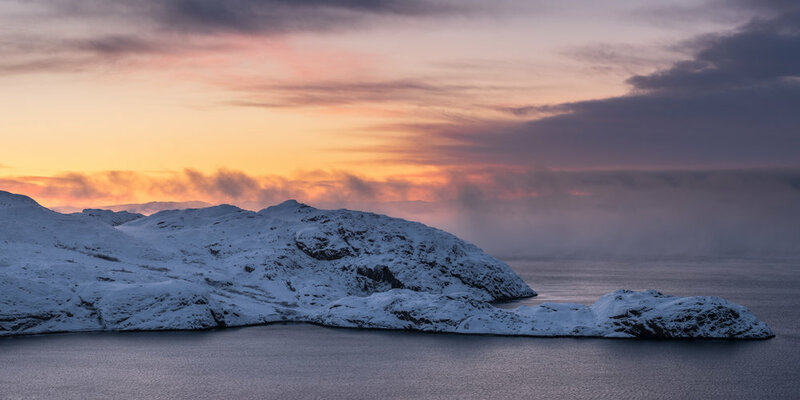 With temperatures down to -30°C at the coast of Finnmark, it gets even colder once you travel away from the coast. This year it hasn’t been that cold so far, but last sunday temperatures went down to -25°C, while around -20°C near the sea. Too cold to be outside you may think, but in this beautiful winter landscape and with the special arctic light I really recommend to get outside. Hot chocolote tastes even better when having been in the cold for some time. There’s one advantage with really cold temperatures - the frost smoke above water creates a unique atmosphere combined with the light. Wouldn’t it be so cold I would be on the water kayaking. But in this case I prefer my snow shoes on land. Even though it’s quite cold outside you get warm while snowshoeing. Moving through the snow can be exhausting, but in this weather I don’t mind as the exercise also keeps me from freezing. We even took a break after some time when it was time for some chocolate - and an image of course! Sure, I would prefer a picnic when it’s warmer. But the experience was worth it, and our huskies enjoy being outside in the snow. As you may have noticed, all images are taken with an 80mm lens - Fuji’s macro lens. I normally use wide angle for landscapes - but recently I found out that I quite like the look of a telephoto lens for landscape (…and in -20°C with cold fingers you think twice before switching lenses). While I have done quite some northern lights photography, I have never tried to photograph any meteors. When I recently read about the Geminid meteor shower, I had to take a try at this. I wanted to do this before, but either had no time or bad luck with the weather. The conditions were not perfect this time either, but at least we had about one hour of good visibility towards the stars. I set up my tripod and took long exposures of the night sky of about 25 seconds. Since you cannot predict precisely where the meteors will show, I simply took many images and hoped to “catch” a meteor. The image above is actually the only one where I managed to do this, you can see the meteor in the center right. I saw many more meteors this night, but it wasn’t that easy to get on camera. Considering it was the first time, I think it’s a good result! I will definitely try this again. Last year I met the adventurer David Cornthwaite in Kirkenes, Norway, where he started on a 1000 mile journey along the norwegian coast. I accompanied him for the first couple of kilometres and started my drone to capture som aerial footage.